Welcome back! 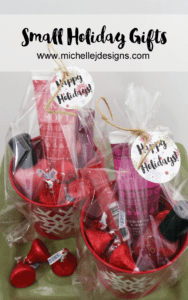 I love to create the perfect, little gift that no one is expecting and I pulled it off this time. 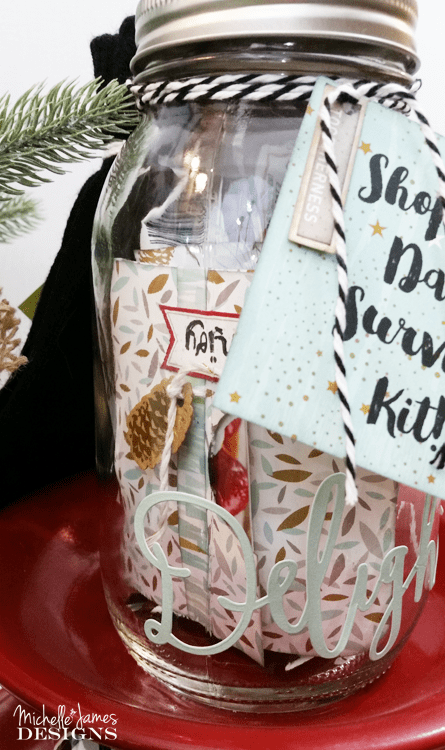 I created the perfect shopping day survival kit for my mom and my friend Kathy. 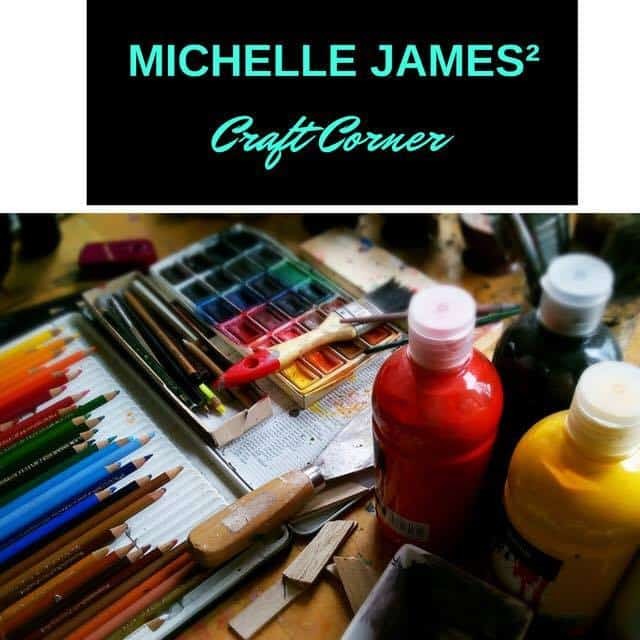 This is my Craft Corner post that I do with my blogger friend Michelle James so be sure to hop over to Our Crafty Mom when you get done here and see what she has been up to. Each year around the beginning of December my mom, my friend Kathy and I take a trip to Mankato, MN to do some holiday shopping. We make a day of it. 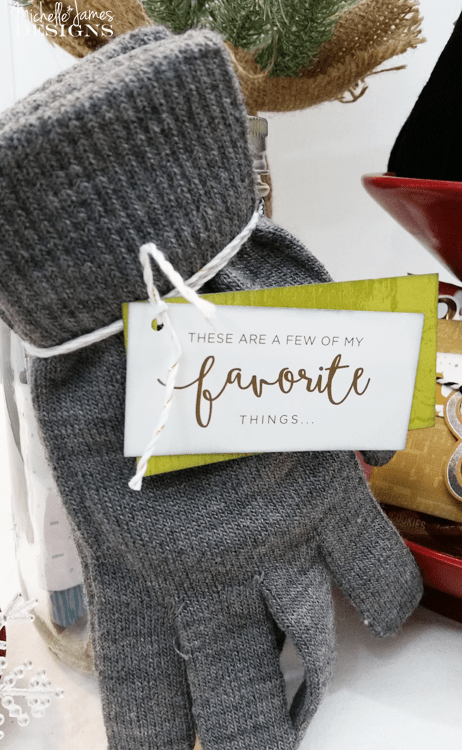 Our favorite things about the day are spending time together, eating good food and enjoying a coffee at Caribou in the mall in the afternoon. We have our ritual. We leave early in the morning, eat breakfast about an hour into our drive at Perkins in Fairmont, MN, shop til about 3:00 or so, stop to enjoy a Caribou coffee, shop more, eat supper at a fun restaurant, shop a little more then make the 2 hour drive home. It’s a long day and this year I took it upon myself to make shopping day survival kits for them. 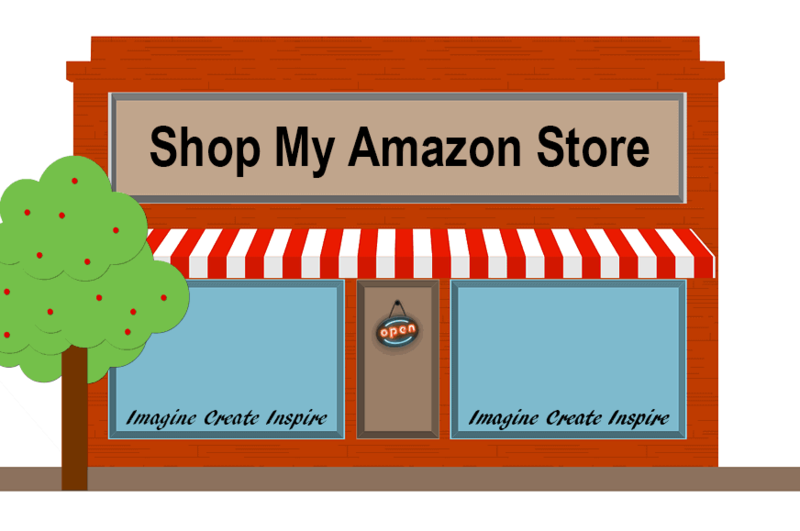 I have included a few affiliate links for your convenience. You can read my full disclosure here. 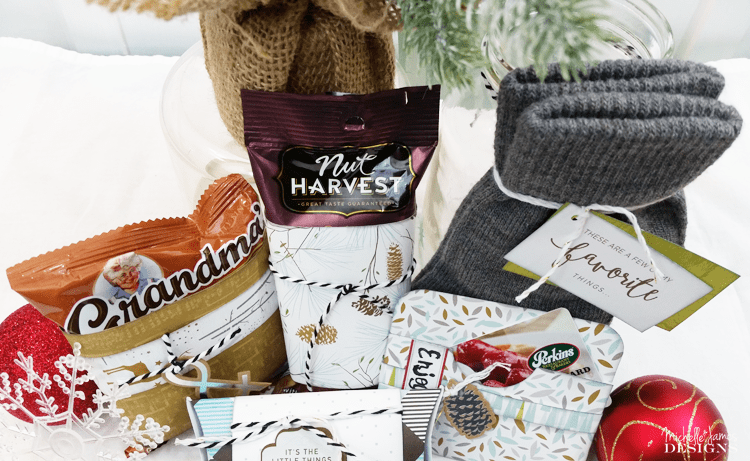 (The “Oh Deer” line of products will only be available until December 31st) If you would like to use the link to my friend Beth Egel who sold me the paper click HERE then enter Hostess Password: 9ACFAB57. 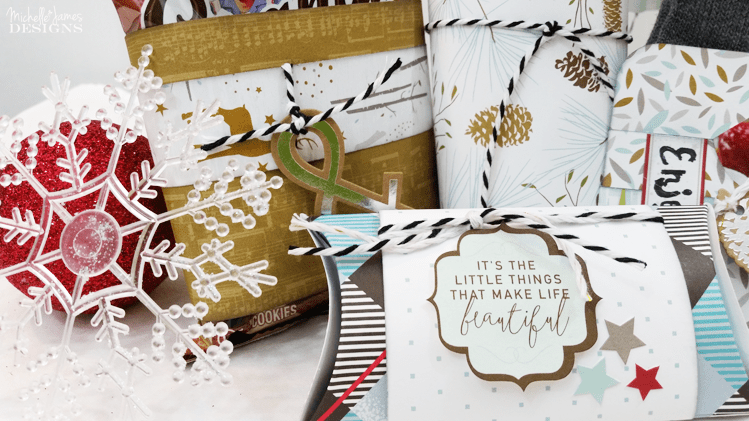 After you are logged in you can go to the patterned paper section, then scroll to the “Oh Deer” paper pack and/or the complements. She will get the sale and the credit! Thanks! Or you can email her at bethegel71@outlook.com. 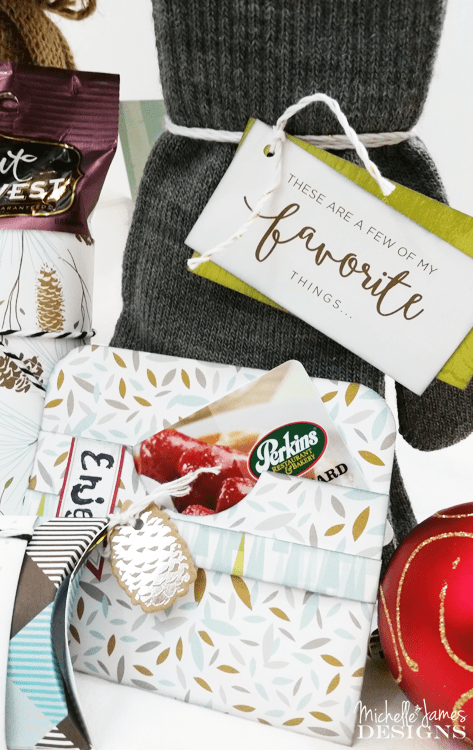 The key to the best gift ever is always in the packaging. You have to make it really cute and appealing. A mason jar is the perfect packaging for the outside but everything inside has to look great too. 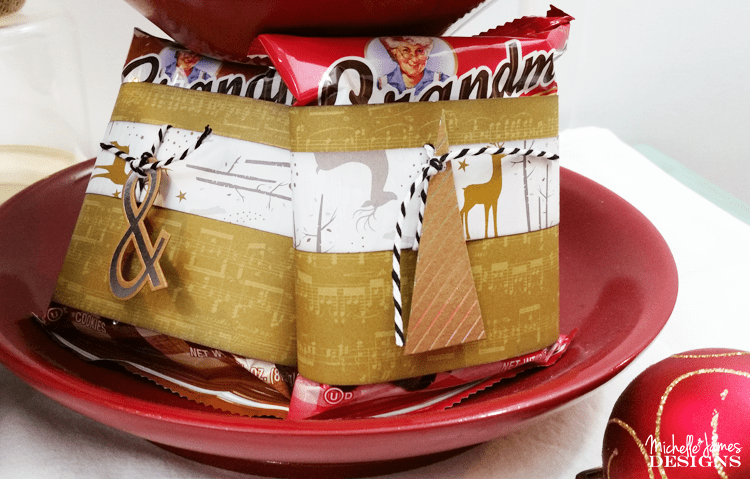 I mixed and matched the papers and coordinating stickers and die cuts to wrap covers around the snacks. This just makes these little snacks a bit classier. These are the Grandma’s cookies. They just look better wrapped in the fun music paper with the coordinating deer paper and a cute ribbon and tag. The gift cards needed something special as well. The Caribou cards came in a really nice pillow box and it was adorable all by itself but I really wanted it to match everything else so I gave it a nice wrap that went all the way around that cute box. Then I added some details to make it even more special. The Perkins gift cards were in a boring, red card holder so I took them out and created their own special pocket. I added a half hole punch on the front for easy grabbing of the card to check it out. Ribbon and and a little pine cone tag made them even better. I knew it was going to be extremely cold (and it was) so I picked up some gloves and added a nice tag to them. I packed what I could in the jar and tied the gloves onto the back. When I purchased the snacks I didn’t really think about them having to fit in the jar. I was looking for something yummy. So I placed the cookies next to the jar when I gave them. 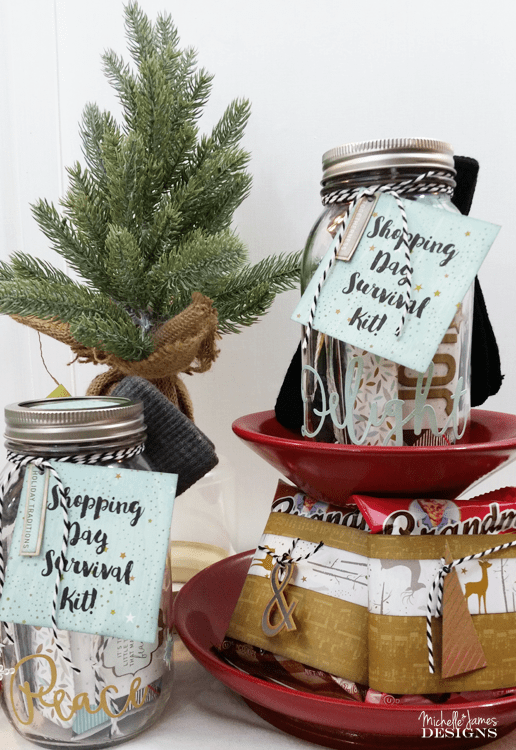 Each jar also got decorated with a big tag and a little tag. 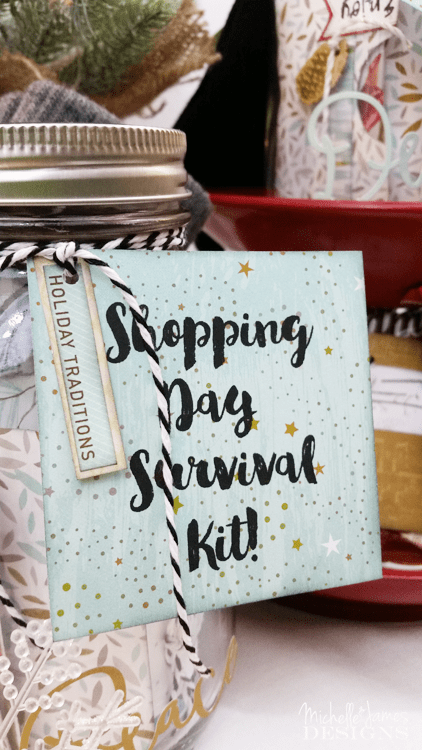 I printed the words “Shopping Day Survival Kit” onto a piece of the paper and cut them out to create a big tag for the outside and added a large sticker to the bottom, front of the jars. 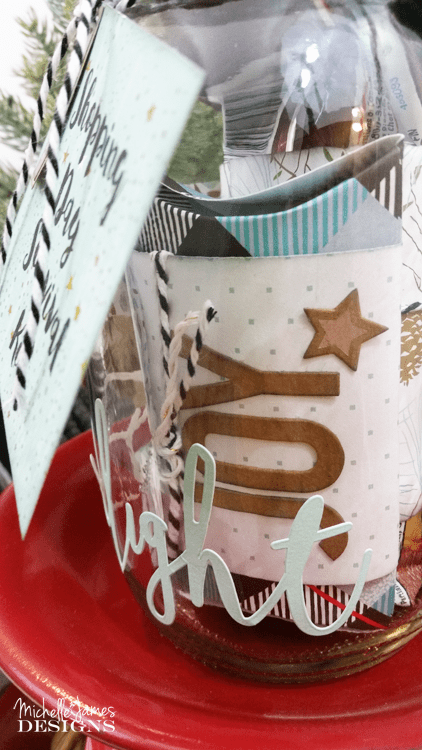 Since the contents of the scrapbooking kit did not include two each of the embellishments and stickers each jar was a little different. The one below says Peace and the one above say Delight. A 2 inch circle cut with my Silhouette machine was added to the top of each jar. 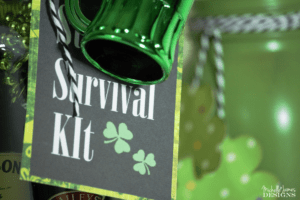 When I brought these survival kits out at the restaurant it was so fun to watch them open everything and they actually did tell me they were perfect! Those are the best words ever when you give a gift. I hope you liked this post because I sure did have fun making these. Don’t forget to follow me on Pinterest. You can see all of my creations there. Also, if you don’t want to miss a post please sign up for the email/newsletter. It goes out every 5 days. Don’t forget to check out Michelle’s project at Our Crafty Mom. 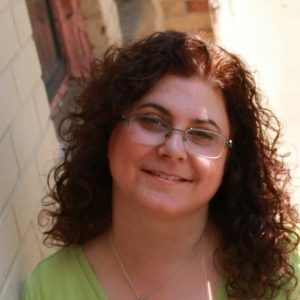 Take a look around while you are there becuase she has been really busy lately with all sorts of shopping guides and holiday decor! You will love it. A lovely gift, Michelle; I hope it was appreciated! They really did love them. It is always fun to give an unexpected gift. I love it! Thanks Nancy! These are the coolest!! I’d love to go shopping with you! Haha! Wouldn’t that be fun? OMG they just loved them and it was so much fun to give them. We had a blast the entire day. 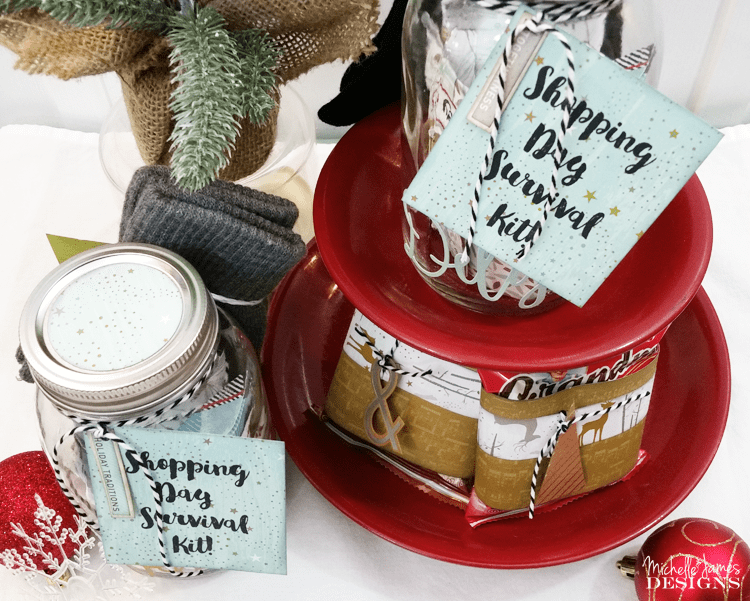 I love these tags Michelle and how you stored them in the Mason Jar is brilliant! They are ever so cute! Thank you Carolann! This was such a fun project. I want to make more!! Love it!! Thanks so much for making a super fun day EVEN better! Hi Kathy! It was such a fun day. We really need to go more often. 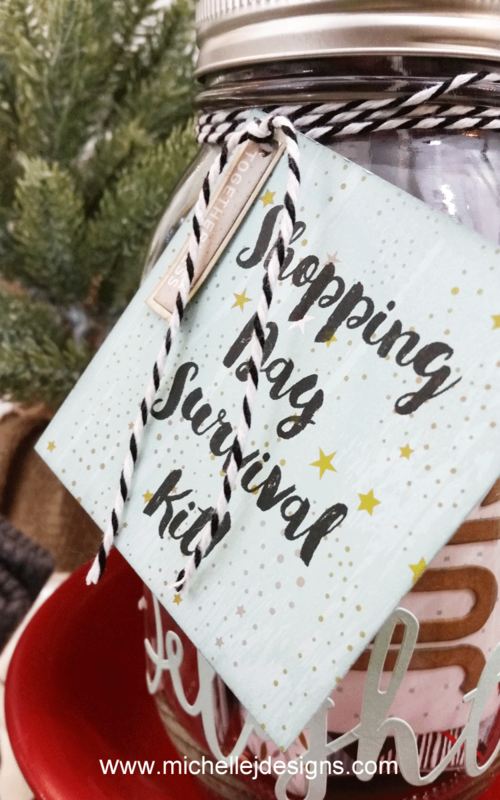 I am glad you enjoyed your survival kit because I had tons of fun making them.